Ellen Hattie Clapsaddle was born January 8, 1863 (although some references denote 1865) in South Columbia, New York to her parents Dean L. and Harriet B. Clapsaddle. She died just before her 69th birthday on January 7, 1934 in New York City. A number of myths associated with this famed illustrator, including that she was stranded while working in Germany during World War I and subsequently became mentally incapacitated during that period, have circulated online for a number of years. Evidence found through newspaper archival research done by diligent collectors have found some of these tales to be untrue (as detailed below). Clapsaddle developed her artistic skills studying at the Cooper Institute in New York City after which she spent a number of years offering art lessons to individuals. She also worked on portrait and landscape commissions for wealthy locals out of a studio in Richfield Springs, New York. She went on to illustrate several postcards that caught the attention of International Art Publishing, and was encouraged by the company to move into the city in 1890. Clapsaddle honed her skills while working with International Art Publishing. 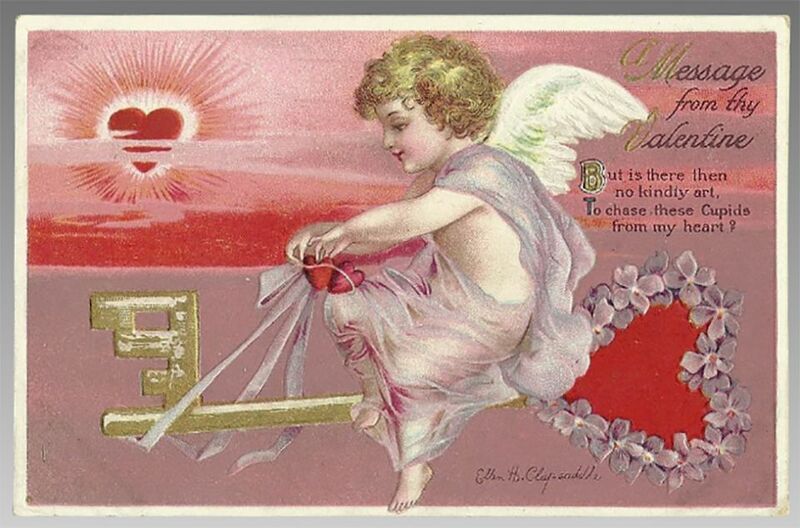 During this period her artwork was featured on calendars, trade cards, Valentine cards, and other types of ephemera from the late 1800s through the early 1900s. At the age of 40, she became a full-time employee of the Wolf Company. She worked for Wolf for eight years as the company's sole designer. She is best known for her colorful artistry found on vintage greeting postcards, many of which featured children and youth with sweet expressions. During her career, Clapsaddle completed close to 2,000 postcard illustrations like the one shown above. Fate Takes Its Toll, or Does It? In spite of a very colorful story of Clapsaddle moving to Germany to be closer to the Wolf Company's engravers and being stranded as World War I broke out around her, this doesn't appear to be true. Information shared by collector Ann Bergin on her Ellen Hattie Clapsaddle Facebook page contradicts this information. It doesn't appear that she found herself confused, alone, and no longer able to earn a living as an artist as some sources report, nor was her mental capacity compromised as previously thought. According to historical documents such as newspaper clippings and census registers, it appears that Clapsaddle returned to New York to continue successfully working as an artist in the greeting card industry during the 1920s. In 1932, Clapsaddle moved to the Peabody Home in New York where she lived for the last two years of her life. She died there in 1934, and the obituaries following acknowledged her as a "noted artist" who had worked in the postcard industry. Ellen Clapsaddle's family migrated from Germany and eventually changed their name from Klepsettle to Clapsaddle. She never married, and had no brothers or sisters. Some sources say that after World War II, her wish to rest near her parents was fulfilled when her remains were relocated with funds raised by the local historical society where they were buried. This, also, does not appear to be true. Bergin shared that while Clapsaddle is buried next to her parents, she was laid to rest there in 1934 rather than being moved later. An obituary published on January 11, 1934 in the Utica Observer, states that her funeral was held on Tuesday, January 10, 1934, and she was buried at Lakeview Cemetery in Richfield Springs, New York. This is the same cemetery where her parents are interred, and they now share a common gravestone with their daughter as evidenced in a photo shown on findagrave.com. Recognizing the quality and charming nature of her work, collectors relish finding vintage greeting postcards bearing Ellen Clapsaddle's signature. Most sell in the $10-50 range, but the rarest cards illustrated by this popular artist can bring several hundred dollars. Some of the most sought after and endearing are sweet Halloween and Santa Claus examples. Even her unsigned cards are recognizable and desirable to the avid collector. Reproductions of her illustrations have appeared on many contemporary vintage-style decorative accessories and postcards as well. To learn more about other interesting and acclaimed artists, read: Great American Illustration Artists.